Here are some facts about the Empire State Building, one of the most famous buildings in the United States of America. 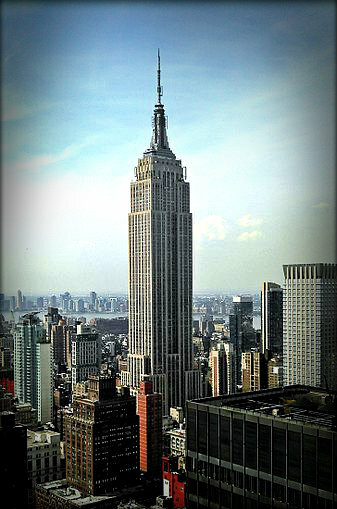 The Empire State building is located at 350 5th Ave.New York, NY. You can visit the Empire State building every day of the week including holidays. The Empire State Building is over 1453 feet tall. It has 6500 windows and 73 elevators. The building is so big it even has its very own zip code (postal code). When it was built, it was the tallest building in the world. William F. Lamb designed the Empire State Building. At the time he worked for an architectural company called Shreve, Lamb and Harmon. He produced all the drawings and plans in only two weeks. The Ceiling Mural was originally created in 1931. The mural is over 15,000 square feet of canvas and uses over 1300 square feet of 23-karat gold leaf. The Empire State Building has won many architectural awards over the years. In 1995-96 it was named one of the Civil Engineering Wonders of the World. The Empire State building has been named one of the Seven Modern Wonders of the World and it is an Art Deco cultural icon in the United States. The Empire State building has appeared in numerous movies over the years, including: King Kong, An Affair to Remember, Sleepless in Seattle, Elf and Percy Jackson and the Olympians: The Lightning Thief. Andy Warhol made a silent movie about the Empire State Building called Empire. If a coin is dropped from the top of the Empire State Building it will be travelling at a speed of about 65 mph when it hits the ground. Not fast enough to kill someone or to damage the sidewalk. In Roald Dahl’s James and the Giant Peach, the enormous peach is skewered by the Empire State Building’s lightning rod. LEGO have produced a miniature Empire State Building model (set 21002) as part of their Architecture series. It contains only 77 bricks. A farm and a stream were once located on the plot of land on which the Empire State Building was constructed.